Joy is so important to live your life. I try to live like that, to have as much joy as possible. Half the time when I’m talking about things that upset me, I’ll throw in a joke and find a way to laugh at it. I accept it and I’m not going to stop fighting for a change, but there’s no point in being upset. Having happiness in your life really improves it. I could cite so much research on that one little thing. It’s hard to find, though, in the world we live in. This book is a great introduction to this through an interreligious dialogue between Buddhism and Christianity, two widely different religions that come together. This book brings up a lot of concepts, but I’m only going to touch on a few. For me, compassion is key. I’ve had a love of the topic since I read Pema Chodron last year. She’s an amazing author and if you haven’t read her, I’d highly suggest it. She brings in so many base concepts and ideas to live by. Yes, she weaves in religion, but you can take that out and still find truth in it. Compassion leads to so many things since, to properly practice it (and, by that, I mean a specific Buddhist practice that I won’t get into here) you have to first love yourself. That brings joy. Then, you extend compassion to friends and family then to people you feel neutral about to people you somewhat like and even to people you don’t like. It grows your joy, being able to see how we’re all the same with the same wants. The next two are humility and humor. I see them as very combined because to have humility, you have to find humor in things. And to find humor, you need to be humble. I always laugh at myself. Not a day goes by when I, much like Tutu, make a self-depreciating comment about myself. It sets off the situation and keeps me from getting on my high horse. Then, I also admit when I don’t know something. I don’t like pretending. I’ve done that enough in my life to know it’s not for me. Now, as I said, the world is a very different place. It’s full of hate and sadness. Just when I was listening to this book, Hurricane Harvey was on the news. Not to mention the transgender ban from the military. Or the white supremacy battle. I hate to say this and agree with Trump, but there is hate on both sides of this. We do need more people like the Dalai Lama and Archbishop Tutu. Self-change leads to changing the world. I completely recommend this book. 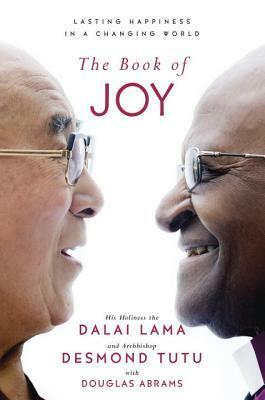 I recommend the audiobook more so since the man who compiled these dialogues narrates it, and there are two other people who read as the Dalai Lama and Archbishop Tutu. It adds a lot to the listen, not to mention that there are so many practices at the end (mainly Christian and Buddhist) that you can find out what could work for you since most really aren’t that religious. Aw, great review!! And YES having compassion is so important in life. Kindness really does make a different. Kindness really does. It’s something I need to work on at times, but it brings so much to your life. Taking a step back and thinking about what you’re attributing to a person rather than blindly going with what you always do. Sweet! It’s a really good book. A bunch of old men talking about life and joy. Men who have seen so many attrocities committed against their people. I want to own it so I can write all over the damn thing.